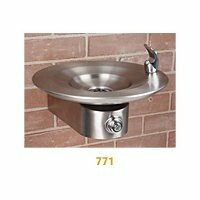 Model 771 of wall mounted drinking fountain has a flying saucer design and is suitable for many prestigious locations. Manufactured from 304 grade stainless steel, with a grained finish. Newly added are models D450 and D441. 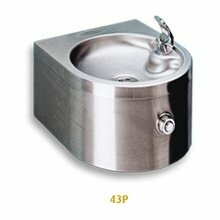 While D450 is a standard fountain, it is manufactured in Fibrotrace®, a tough GRP type material. Model D441 has been designed so as to allow wheel-chair access and is DDA compliant. 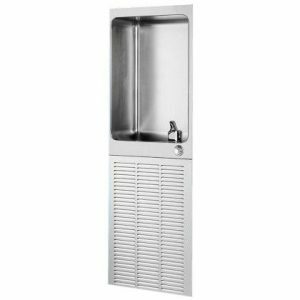 Both these fountains are particularly useful for installing in swimming pool and sauna areas where the chlorine and general environment can corrode stainless steel. 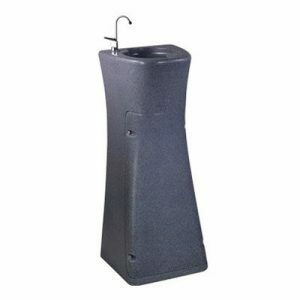 These fountains are available in a selection of colours and also with simulated granite finish in five shades. Unusual is model 771 that has a flying saucer design and is suitable for many prestigious locations. Recently, we added model D701 which replicates this fountain except that it is made in Fibrotrace®. All of the models featured are available with PIR.